A voyage of Lough Léin on the Lily of Killarney Lake Tour with unique views of the Lakes, Islands and Castles of Killarney National Park. 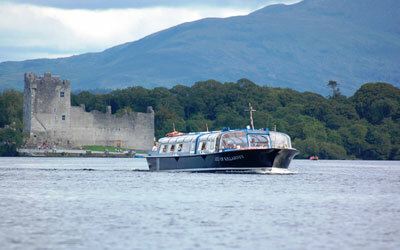 Cruise through Killarney National Park proves to be a fascinating treat for all visitors. Take in the fabulous and picturesque views of Killarney National Park which tell a tale of the ancient history of the area. 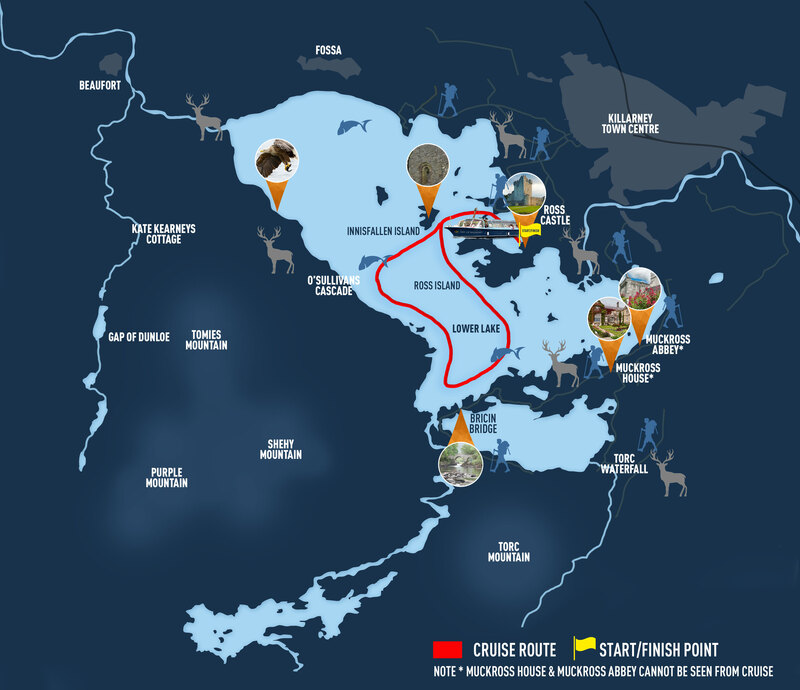 What’s more, your cruise won’t be just any ordinary cruise - you will be enjoying the views while comfortably seated in a modern glass covered boat guided by your captain. 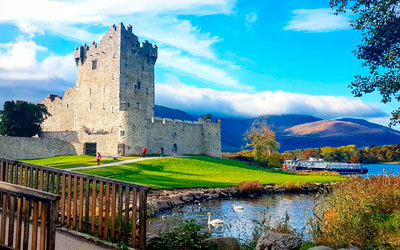 Your tour starts as you set off from the 15th century Ross Castle and cruise the Lakes of Killarney in the comfort and safety of a covered, heated and modern vessel. Drift past the ruins of St. Finian’s 6th century monastery on Innisfallen Island. 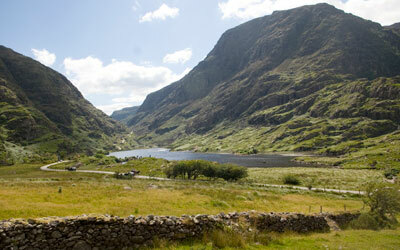 Continue to the foot of the MacGillycuddy Reeks and view Ireland’s highest mountain, Carrauntoohil. Pass Ross Island as the captain points out the unique and incredible flora of the area including the ancient Oak and Yew forests. 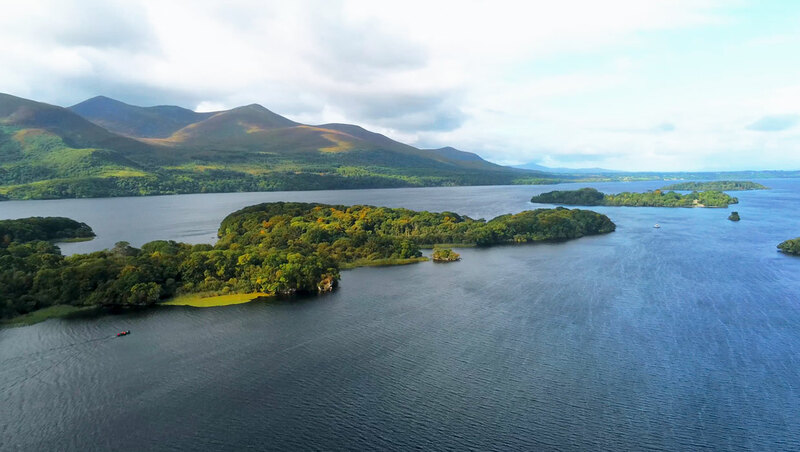 The Lily of Killarney Lake Tour is an enjoyable way to take in the lakes and mountains where you can peacefully relax and enjoy panoramic viewing of Killarney otherworldly lakes and majestic, magical mountains. 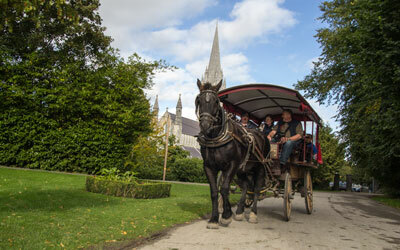 We really enjoyed both the cruise and jaunting car ride for different reasons. It's always peaceful to cruise on the water. This was especially because we not only learned about the monks that lived on an island in the middle of the lake but also learned about the way the lake was formed and how difficult it is to navigate through it's shoals and rock outcroppings. The jaunting car (which I learned is an Irish thing) was a blast. Our driver was a total character. we rode through the Killarney Park and saw two different types of deer and then by the lake before returning back the hotel. Our driver, who was in his 70's, was hysterical. He told a few off colour jokes which made to tour even more fun. all in all two great experiences. We thoroughly enjoyed the morning at Ross castle, taking the one hour boat cruise and the one hour jaunting car tour with Harry the horse and Mike the driver, fun stories and lovely views. Excellent value ride on the jaunty car and waterbus tour around Killarney Lakes was fabulous. You can spend a couple of hours and it is a great way to see part of Killarney national park and very relaxing trip around the lakes. Tangney Tours gave us a great time while we holidayed in Killarney Ireland. We visited Muckross House & Gardens, Ross Castle, had a cruise on the Lakes of Killarney on board The Lily of Killarney and we also took a day trip of The Gap of Dunloe - Our good memories of Killarney will last a lifetime thanks to The Tangney Family. We are Irish and had friends visiting from Hong Kong with a young child. We had a great Jarvey on our Jaunting car, Mike, who had great stories and knowledge of the national park. We combined it with a Lake cruise on the Lakes of Killarney. We really enjoyed the day and our friends had a blast too, highly recommended. All in all unmissable experience for young and old. We went on the Lily of Killarney with the kids and had a pleasant time. The captain (Niall I think) was a real pro, the perfect mix of knowledge and humour. I would recommend this trip to any of my friends and family. Since we first worked with Tangney’s of Killarney several years ago, we have had the pleasure of working with Laura, Paul & Michael delivering exceptional experiences for our clients visiting Killarney. Our requests have seemed to get more and more complex in the challenging time-tables and complicated logistics now seem to be par for the course. But Laura has always found a workable formula, and her team has always delivered impeccably, resulting in our clients being 100% happy every time with their tour experience. And so have we , to the point that we at Odyssey look forward to each new season and an opportunity to partner once more on several programmes with Laura and her wonderful crew.